I’m certain various health authorities would recommend that you do not look directly at the photos in this post, please try to find one of those eclipse viewers from the late nineties – it’s probably crumpled at the back of the kitchen drawer. Alternatively, you will be safe if you view through your car sunroof. Consider yourself warned. Mandy advised me to try something soft, colourful and soothing as a remedy for the aptly named tangled yoke – and I always follow advice which implores me to knit more! Two finished Mardi Gras socks and I can say with some certainty (and a hint of singed retina) that these will see off all winter blues! H loves them. 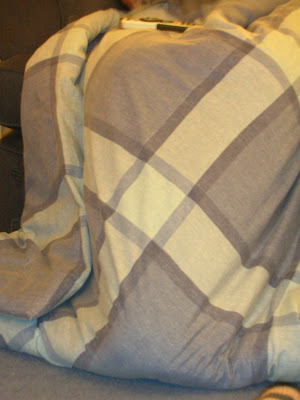 Keeping someone’s feet warm under the end of the quilt and I don’t think they are coming out for a while! The yarn is Colinette Jitterbug Mardi Gras (with a smigin of STR Dragons Dance to give me enough yarn to complete the bind off!) 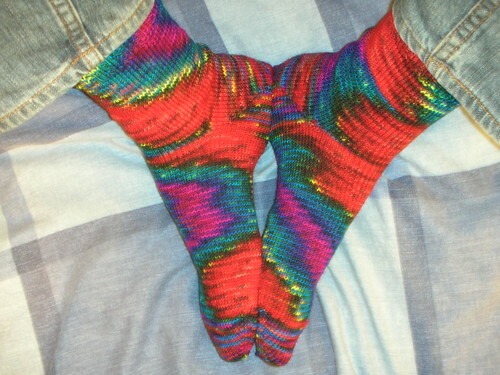 and the socks were knit toe up starting with 12 sts on each of two needles, increasing to a total of 68. I did 65 rounds of the foot and then a short row heel over 40sts working to a minimum of 10 unwrapped stitches in the middle. The leg has 46 rounds in stst and then 9 rounds of 2×2 rib and a sewn bind off. As I said, I have no leftovers, this pair of socks for a UK size 10/11 foot is all you will get out of a skein of Jitterbug. I hope you all feel considerably more cheerful looking at them – such is the power of these socks that they actually sparked a conversation on the Tube today (we’re English, such things do not usually happen). As I zipped round and round the leg of the second sock I completely failed to notice a couple of builders watching me from where they stood nearby until I wrapped it all up just before my stop; “Don’t stop”, said a voice, “you’re making my journey go so much quicker – it’s very soothing watching you”. I grinned and they asked if I was making a scarf (seriously – it looked pretty much like a sock at this point!) so I explained and we talked about how long it would take to make the pair. One guy remarked that it would be quicker to go to Primark and buy a pair and his mate replied in shock “you can’t say that – look at it!”. You can’t get colours like this at Primark and I think somewhere in London there is a builder with a burgeoning inner knitter – keep your eyes peeled for balls of yarn dangling off construction sites! 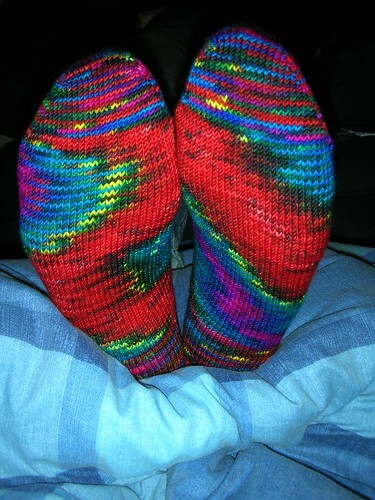 Carie, I loved your post and your socks are wonderful! 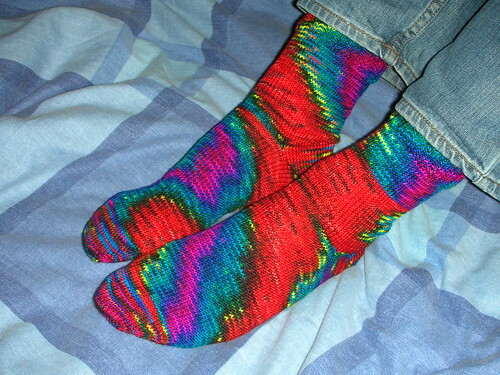 I’ve knitted a few socks and I can say without a shadow of a doubt that these leave my brightest pair in the shade. them socks are fabulous. LOVE the brightness. Plus I love the story of the builders. I wish I knitted more out in public. Wow, those are some crazy colorful socks! Wow, they are iridescent, they remind me of spots of petrol/oil floating on water in bright sunshine, so often observed in puddles in my youth. They absolutely shimmer. I love them.